Cast your kindly light upon your faithful, Lord, we pray, and with the splendor of your glory set their hearts ever aflame, that they may never cease to acknowledge their Savior and may truly hold fast to him. Who lives and reigns with you in the unity of the Holy Spirit, one God, for ever and ever. The Magi are called "saints" for the first time in the writings of Archbishop Hildebert of Tours (1133). In the twelfth century their veneration spread over all of Europe. The authorities of the Church did not prohibit this cult, and Epiphany acquired the popular name of "Feast of the Three Holy Kings" in most countries of Europe. The name Magi is not a Hebrew word, but of Indo-European origin, and means "great, illustrious." Saint Matthew mentioned the term without explanation because it was well known to the people of Palestine. The Magi originated in Media (Persia), and their caste later spread to other Oriental countries. They were a highly esteemed class of priestly scholars, devoting themselves not only to religion but also to the study of natural sciences, medicine, mathematics, astronomy, and astrology. In several countries they were members of the king's council. Where did the Magi come from? Saint Matthew gives a general answer: "Wise men from the East." In modern terms, it could have been from any one of the countries of Arabia, Iraq, Iran, Afghanistan, or India. It has never been exactly determined from which of these countries they came. The first was called Melchior; he was an old man, with white hair and long beard; he offered gold to the Lord as to his king. The second, Gaspar by name, young, beardless, of ruddy hue, offered to Jesus his gift of incense, the homage due to Divinity. The third, of black complexion, with heavy beard, was called Baltasar; the myrrh he held in his hands prefigured the death of the Son of man. There is an old legend that when many years had passed the Magi were visited by Saint Thomas the Apostle, who, after instructing them in Christianity, baptized them. They were then ordained to the priesthood and made bishops. It is said that once more the star of Bethlehem appeared to them and reunited them toward the end of their lives. "The city of Sewa in the Orient" is given as the place of their burial. 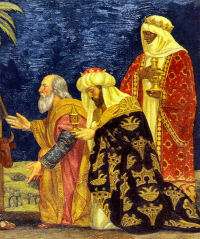 The legendary relics of the Magi were brought from Constantinople to Milan in the sixth century. In 1164 Emperor Frederick Barbarossa obtained them from the archbishop of Milan and transferred them to Cologne. Their shrine in Cologne was, and still is, the center of many pilgrimages.